Why Are Austin's Trees Having Such A Colorful Autumn? The downtown skyline and fall foliage colors in South Austin on November 26, 2018. Austin is known for a lot of things, but fall foliage is not one of them. That is, until this year. Local trees are putting on an incredible color show lately. It seems like it came out of nowhere, but it didn’t. “This is my 24th fall in Austin, and I've never seen the tree color as varied and vibrant as it is this year,” Doug Addison wrote to KUT's ATXplained project, asking: "Why? Or is it my imagination?" It's not your imagination, Doug. Doug Addison says in 24 years he can't remember ever seeing fall colors this beautiful in Austin. It turns out there are three ingredients that went into making 2018 the best fall foliage year in recent memory: water, cold, and tree diversity. In September and October, Austin got almost 16 inches of rain. That’s well above average, according to April Rose, the Urban Forest Health Coordinator for the City of Austin. 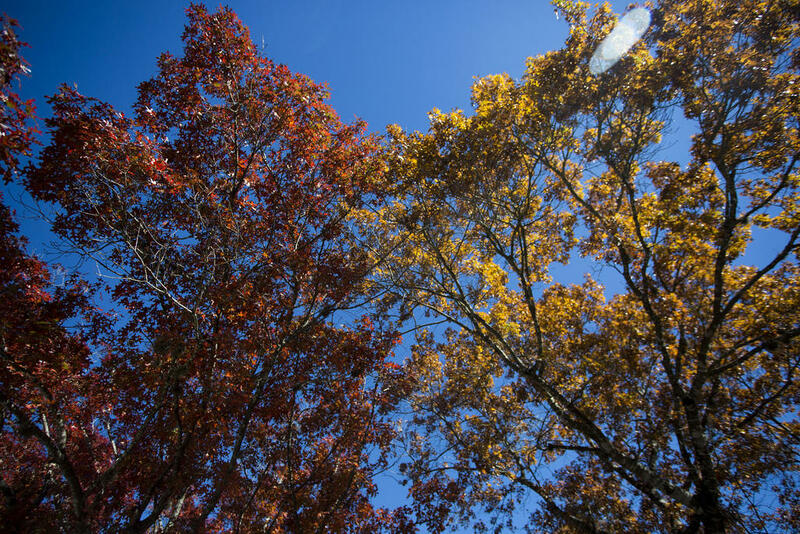 Without getting too deep into the science, more leaves stayed on trees to see shorter days and cooler temperatures. Those are two things that trigger those brilliant fall colors. Our cooler-than-average September and October helped, too. But different leaves react differently to the cold. That’s where our final ingredient — tree diversity — comes in. Fall foliage colors in South Austin on November 26, 2018. Over the years, Austin’s urban tree canopy has become much more varied in the different types of trees it contains. Part of that is intentional — the city plants different kinds of trees to prevent species-specific diseases from doing too much damage. But, it also means good fall foliage conditions bring lots of different colors than Austinites normally see. “It just seems like all over town, all the trees are getting in on the act,” says our question-asker Doug Addison. TELL US: When Can You Call Yourself A 'Real' Austinite? What makes a “real” Austinite? Why Are There So Few Homes With Basements Around Austin? Lindsay Nakashima has lived in her East Austin home for about five years. As far as she knows, hers is the only house around that came with a basement. Nakashima says a previous owner dug out the space so he could park his car under the house. What Ever Happened To Aqua Fest? The Austin City Limits Music Festival, which kicks off tomorrow at Zilker Park, has long drawn comparisons to Austin’s first big festival: Aqua Fest. What ever happened to Aqua Fest? And why did it stop?